America’s freight railroads provide exceptionally rich health care benefits to employees and their families. Those benefits substantially surpass the coverage provided by other U.S. industries and the railroads shoulder far more of the benefit costs, which will exceed $2.6 billion this year. By virtually any measure, rail employees’ current health care arrangements are significantly outside the mainstream. Common sense benefit reforms are essential for the rail industry to remain competitive in today’s economy. These must include changes to medical and pharmacy benefit design and employee contributions, as well as the addition of broadly adopted consumer-focused innovations. These changes are necessary to bring railroad health care programs closer to mainstream norms while still providing employees outstanding benefits. A commonly used measure of the richness of a health care benefit plan design is its actuarial value, the percentage of total average costs for covered benefits that the plan will pay. Comparisons to various benchmarks illustrate how far the railroad plan is out of step with other health care plans. The Willis Towers Watson 2016 financial benchmark survey demonstrates the extraordinary richness of the railroad plan. The average actuarial value for plans in that survey is 84%, nearly 10 percentage points lower than the railroad plan. So, too, does a comparison with the Federal Employee Health Benefits Program (BCBS Standard Option), which covers some 1.8 million employees and retirees and has an AV of 87%. 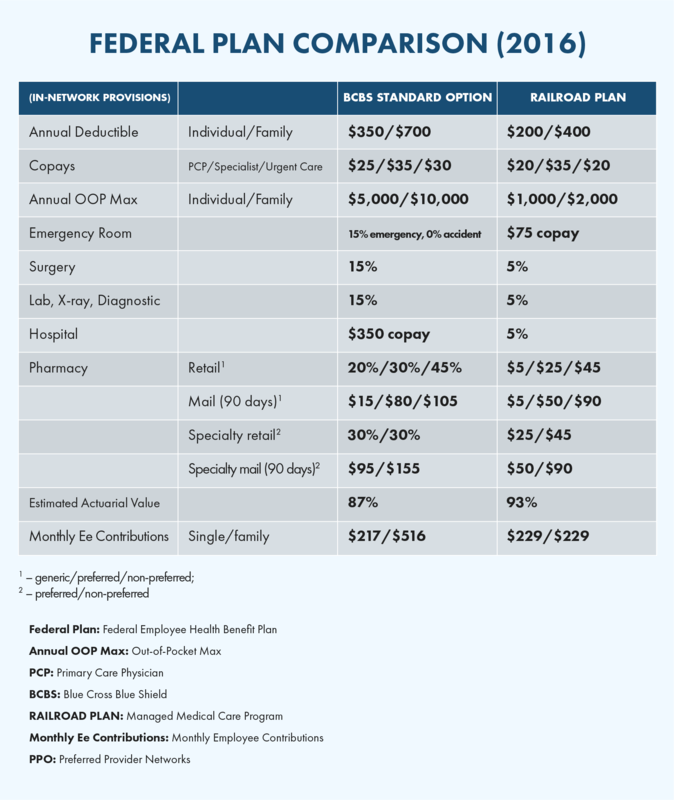 As another point of comparison, the railroad plan’s current AV exceeds even the most valuable “platinum” coverage tier (90% AV), as defined by the Affordable Care Act (“ACA”). 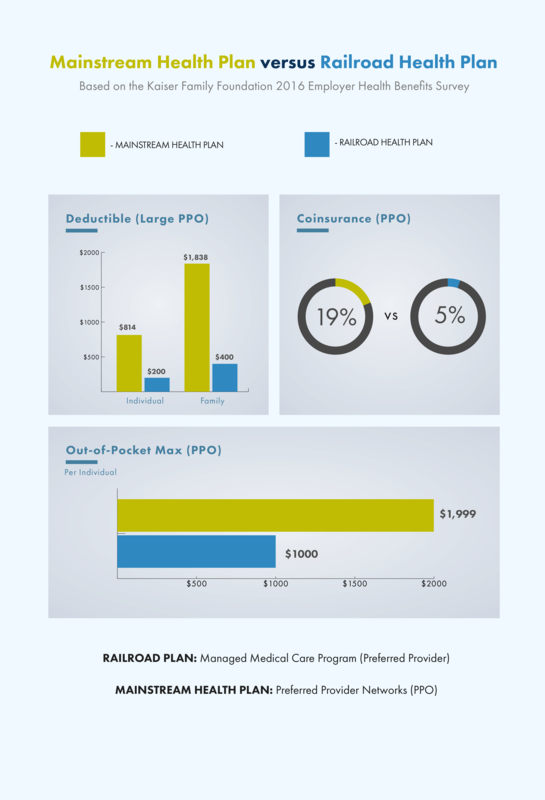 The generosity of the railroad plan’s major benefit design features compared to other employer plans is further underscored by findings from the Kaiser Family Foundation’s 2016 Employer Health Benefits Survey. So, too, does a comparison with the Federal Employee Health Benefits Program. The cost of health care coverage under the railroad plan has increased by almost 30% over the last two years. In 2017, these benefits will cost more than $2.6 billion, with the railroads paying about $2.3 billion of that cost. The annual 2017 plan premium per employee to provide employee and dependent coverage is $19,889. The employee will pay $2,747 (14%) of that amount as a direct contribution toward coverage. The railroads pay the remaining $17,142 (86%). The employee’s 14% contribution share is about 10% lower than the contribution share paid by employees in other industries. This hefty cost does not include dental or vision care, for which the railroads pay the entire premium. Compared to other industries, railroads pay a significantly higher share of total costs to provide health care to employees and their families. Railroads currently pay about 80% of total health benefit costs. Employees pay the remaining 20% through a combination of deductibles, copays, coinsurance, and direct premium contributions. By contrast, employers in other industries pay about 65% of the total benefit costs according to the Willis Towers Watson 2016 financial benchmark survey.